For Real Bed Bug Relief, Call The Bug Man! | The Bug Man, Inc. Vacuum, and change linens weekly – Unlike other insects, cleanliness seems not to be a deterrent. However, at the early stages of an infestation, you may be able to keep them away by vacuuming your carpets, mattresses, and box springs. Be sure to wash all bed linens weekly with the hottest water that you can. If you have a comforter or throw pillows, don’t throw them on the floor, and make sure that they’re also washed at least once a month. 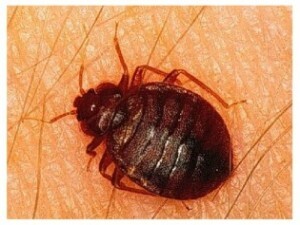 Inspect your luggage after traveling – Bed bugs prefer densely populated areas, and you’re just as likely to encounter them at a five-star hotel as a cheap one. That’s why you should always inspect the sheets and mattresses of any bed you sleep in. You’re more likely to find bloodstains than bugs, but if you find anything, you might want to seek out other accommodations. You should also never to leave your suitcases on the floor, and take a good look in the corners as you unpack. Inspect second-hand furniture and clothing before bringing it into your home – You may not be able to launder all the upholstery on second-hand furniture, but be sure to take a good look in every nook and cranny before moving it inside. You should also never assume that second-hand clothing was washed before being hung on the sale rack. Wash it all in the hottest water that you can before wearing it or hanging it up. Bed bugs are a nuisance, but they’re no match for The Bug Man! Schedule your service call here, or give us a call at (501) 663-9464! This entry was posted	on Wednesday, April 5th, 2017 at 3:51 pm	and is filed under Bug Control. You can follow any responses to this entry through the RSS 2.0 feed. You can skip to the end and leave a response. Pinging is currently not allowed.